Quilting guru Angela Walters is back at it again with another tutorial. This time, it’s for machine quilting with a ruler– particularly, with a long arm. This tutorial differs from other YouTube tutorials in that it’s actually a lecture from a quilting course she taught in Canada. So not only is it a cool technique, but it’s like sitting in on a real class! Using a ruler to quilt is simple: it creates gorgeous designs with minimal effort, and it’s a great way to utilize your long arm. Here’s how you do it. What you need to keep in mind to do this correctly is two things: one, you need to stop your needle to reposition your ruler as you quilt, and two, you need a ruler base. A ruler base will basically prevent the long arm from wreaking havoc on the ruler– and your quilt– as well as ensure your stitches are actually lined up properly in the design. 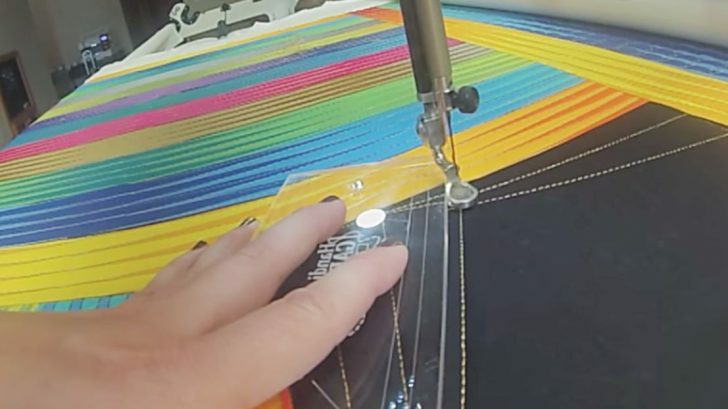 After you get those things out of the way, the rest is easy: just whip around the long arm with the ruler positioned next to where you want the stitch. Continue to do this as you quilt, and eventually, your block will be done! How cool is that? What kind of blocks will you do with this technique?